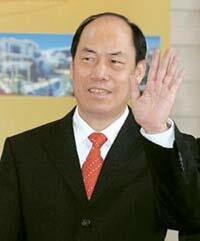 Undated file photo of Yang Guoqiang, Country Garden's founder and chairman. His daughter Yang Huiyan became the richest person on the Chinese mainland after the Hong Kong listing of the Country Garden Holdings. A 25-year-old woman became the richest person on the mainland on Friday following the debut of the Country Garden Holdings Co. Ltd on the Hong Kong stock exchange. Huiyan Yang saw her wealth surged to HK$66.64 billion (yuan) after the Guangdong-based giant property developer opened at HK$7.01 per share in the Hong Kong stock exchange, an increase of 36 per cent over the IPO price of HK$5.38. Her private company, Bisheng holds 9.52 billion of the total 16 billion shares of Country Garden Holdings. That enabled her to surpass the "Queen of Wastepaper" Zhang Yin as the wealthiest person on the mainland. Yang is the second daughter of Country Garden founder and chairman Guoqiang Yang, who accumulated his wealth in property development. Ten of the property developer's shareholders made into the Hurun Top 100 Rich List last year.